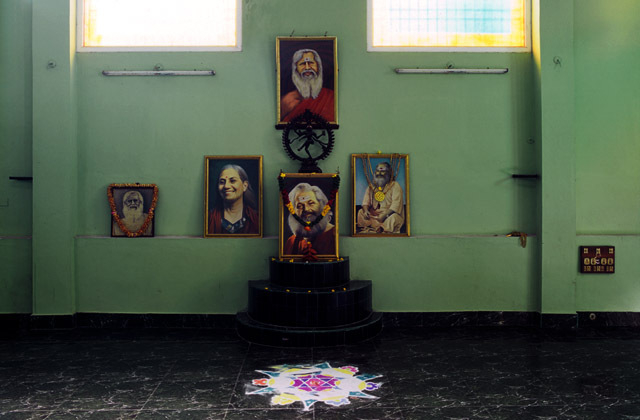 Last week we started sharing with you about Otto’s experience in an Indian ashram. Here’s more on Otto’s first night in the ICYER Ashram. We arrived in Pondicherry on the 3rd of February, and on the same night there was a special event: the all-night Om chanting. Yes, chanting the magic “OM“ for hours and hours. This unusual event was for Swami Kanakananda’s Birthday. In India it is uncommon to celebrate a birthday because it shows that you have failed in your previous life and have to be reborn to continue your karmic journey, but we celebrated it just like Swami Gitandanda used to do. The OM, or let us say A-U-M, resonates in your body. The A in your stomach, the U in your throat, and the M in your nose, or head. The AUM sound is to continue all night, without any break. For this to happen, at least 2 students have to alternately chant while other students have a rest. We started around 9 PM, and chanted untill the early morning. After one hour I still felt ok. The next hours were also nice and I began to feel addicted to this magic sound. After 3 hours some became tired – but still the sound of “Om” must continue. After some time my stomach, where the sound of “Om” resonates, started really hurting as if I had eaten some unripe fruits, however after one more hour it started tickling in a very nice way. Perhaps this is like the “pain barrier” that marathon runners must break through to release the flood of endorphins that can give them almost superhuman abilities? Luckily, this ashram sees coffee as a pranic drink. This helped me a lot to stay up nearly all night and, combined with the constant resonance of the AUM it had a cleansing effect too! What a wonderful start and what an amazing energy created in the ICYER Ashram. To learn more about the ICYER ashram and other ashrams in India, check out our directory of yoga centres in India. You may also consider reading our book on the top yoga centres in India to find the right centre for your needs!